Bluestem: How does my garden grow? Well, thanks for asking! It's doing pretty well. I mean, some things better than others. Here are a few highlights. My garden is just like Millineum Park. 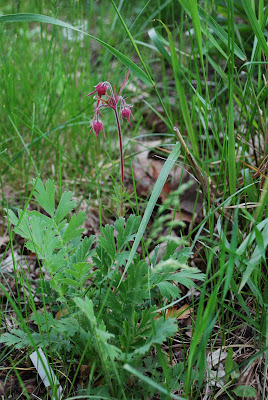 Except while I only have one blooming prairie smoke plant, that park has thousands. But let’s not quibble. I have one! How exciting. 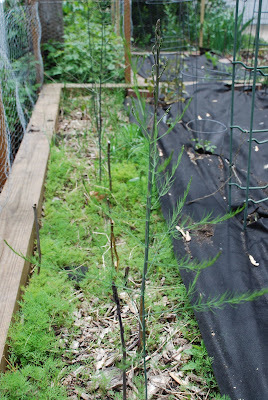 Below is my purple asparagus, that row of tall thin spindley things. The insanity covering the ground is my horde of dill sprouts. I have thousands. Would you like some? And lastly, my potato plants. 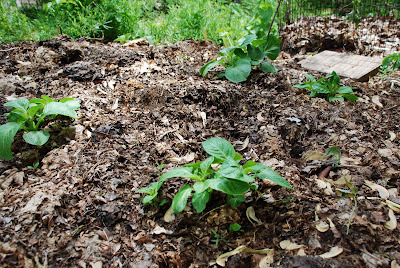 They are growing vigorously, probably because I planted them in the old compost pile. Well, soon I'll be feeding my offspring off the fruits of my labor and land. What could be more satisfying? This is your 100th post!